Take a down-to-earth approach to staging, completing, and cleaning up after your next paint job with the Airless Spray System from HYDE! Have you ever turned a blind eye to the chipping paint on a wall or ceiling to avoid the ordeal of redoing those hard-to-reach areas? You’re not alone. DIYers and professional painters who tackle these jobs end up breaking a sweat (and sometimes even a limb) climbing ladders and scaffolding to get at these high-level interior and exterior surfaces. 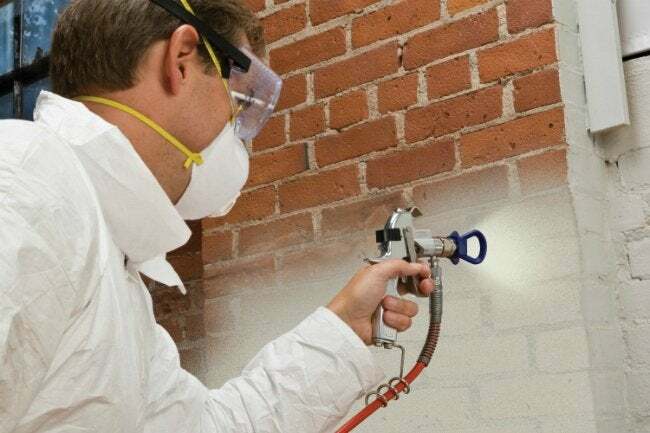 Airless sprayers can reduce the manual effort of painting by brush, but only one special design can transition from ground level to upper-story paint jobs without interruption: the HYDE Airless Spray System with Rapid Valve Transfer (RVT) Technology. 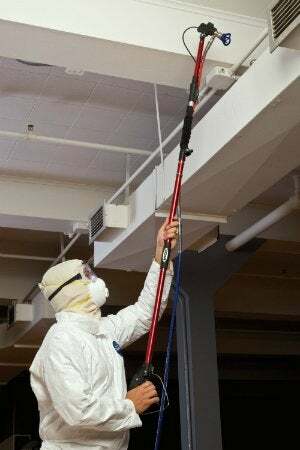 This superhero paint sprayer saves hours of staging and painting by eliminating the need to haul in, position, and reposition a ladder as you cover sprawling surface areas top-to-bottom with paint. And when the job’s done, just think of the time you’ll save during cleanup, when you have to deal with just one hardworking tool! Fully assembled, the HYDE system features a powerful spray gun, a spray tip with a shield and filter, and a five- or eight-foot extensible spray pole. True to its name, though, the heart and soul of the spray system lies in its unique, transferable spray valve. Not only can the valve withstand up to 3600 PSI to help you speed through jobs involving a variety of paints and coatings, but RVT enables the valve itself to be transferred live from the spray gun to the spray pole and back again. So, you not only get two painting essentials for the price of one, but you can also transition seamlessly from one to the other as needed. For a silky-smooth paint finish on surfaces at chest level or below, such as door frames, wall patches, and woodwork, operate the spray gun by simply attaching its hose, tightening the fittings with a wrench, powering up the sprayer, and targeting the surface in need of a refresh. From here, it’s a cinch to switch gears and move on to new heights to tackle upper walls, ceilings, eaves, or exterior shutters. You don’t have to depressurize the gun or power down the spray system while you set up a ladder or scaffolding. Instead—keeping your feet firmly planted on the ground—lock off the gun, release the valve, and transfer it into the telescoping pole. This smooth maneuver instantly converts the gun into a spray pole that extends up to 12 feet in length, depending on which of the poles you purchase. Need to lower the height of the pole? Turn the wing nut and adjust the pole to the desired length as you travel down the surface, then continue spraying. When you’ve worked your way down to an area within arm’s reach, transfer the valve back to the gun to continuing painting or apply a few touch-ups. The smart design of the HYDE Airless Spray System with RVT Technology eliminates the need for a heavy spray gun at the top of the pole, leaving you with a lightweight, easy-to-maneuver spray pole that minimizes strain and fatigue and travels quickly across surfaces. In fact, the spray system is so fast that in the time it would take for one painter to build and stage scaffolding for a paint job, a painter using the HYDE Airless Spray System would have finished the job and moved on to the cleanup! And as with every other aspect of this innovative airless spray system, cleanup is supremely simple: Unlike the case with traditional spray tip extensions, no paint circulates through the HYDE spray pole, so cleanup becomes an easy, one-person job. Purchase HYDE Airless Spray System with RVT, $440.81.